She is my Wolf Assistant & will be training to be a wildlife handler this year. ABOUT US: "Running With The Wolves" was established over 9 years ago for the sheer love & passion for Wolves. Owned & operated by Teresa DeMaio, certified Pet Care Specialist & Wildlife Handler. I have spent over 20 years raising & training Siberian Huskies & supporting Wolf organizations for over 15 years. With my knowledge & research I decided to start "Running With The Wolves" for the soul purpose of fund raising for Wolf sanctuaries across the United States. 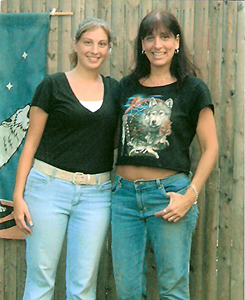 With the help & support of my niece Theresa, we created Long Island's 1st Wolf Expo in August 2004, with live Wolves & their handlers. It now has been established as a annual L.I. event each year in August. "Running With The Wolves" is a vessel for all Wolf Sanctuaries we support in the United States, we bring them together once a year for educational programs & to promote the work that they do. "Running With The Wolves" donates over $3,000 from each Wolf Expo, which is given to help feed & care for captive Wolves & Wolfdog/Hybrids at many Wolf Sanctuaries. MISSION STATEMENT: "Running With The Wolves" is dedicated to the protection of our Wolves in Alaska & the lower 48 states. We focus on Wolves & other Wildlife as well. GOALS: Our long term commitment to everyone who loves & admires all Wolves, is to establish Long Island's 1st Wolf center & Wildlife Exhibit. We at "Running With The Wolves" want everyone to see & enjoy the Wilderness & Beauty of our Wolves up close at anytime throughout the year. We are currently looking for land & hope to be settled in the next year or so. We believe that all Wolves should live in the Wild & we do NOT believe in Wolfdogs or Hybrids as pets. We teach about Wolves & the complexities of Wolfdog ownership. We do support throughout the year with fund raisers for all our sister sites that allow rescued Wolves & Wolfdog/Hybrids to live out their lives in a environment that is best for them. Our goal is to teach that Wolfdogs, as well as pure Wolves, Should Never Be Pets...It's Their Birthright To Live In the Wild... We do, however, believe in Wolf Sanctuaries for educational purposes where all Wolves live in a Wildlife environment & are cared for to the fullest extent where they are loved & admired... Once again enjoy visiting with us & tell us what you think...Please sign our guest book.